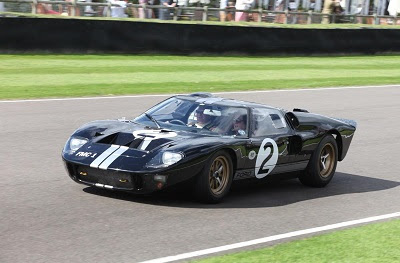 The all-new 2017 Ford GT will be available in a limited-edition Heritage theme honouring the GT40 Mark II driven to victory by Bruce McLaren and Chris Amon at Le Mans in 1966 – part of the historic 1-2-3 Ford GT sweep. The car will feature unique interior and exterior color themes, and wheels. 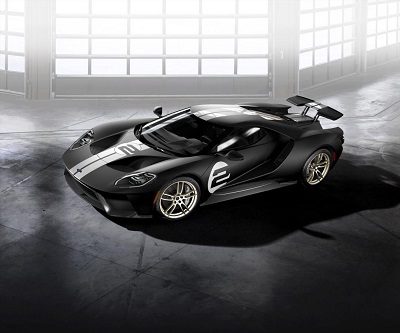 The Ford GT ’66 Heritage Edition features a Shadow Black exterior in either gloss or matte finish with silver stripes and exposed carbon fibre package. The car sports Frozen White #2 bonnet and door graphics, and 20in one-piece forged aluminum wheels in a gold satin clearcoat with black lug nuts. The interior of the limited edition model wraps the Ford GT carbon-fibre seats in Ebony leather, with pillowed inserts and plow-through stitching, and the seats’ head restraints and the steering wheel are debossed with the Ford GT logo. The instrument panel, pillars and headliner also feature an Ebony-leather wrap, with gold appliqués on the instrument panel, the seat’s X-brace and shift paddles. Like the 1966 race car, the steering wheel is leather wrapped, with seat belts featuring a unique blue webbing. Rounding off the modifications to the Ford GT ’66 Heritage Edition are a unique serialised identification plate, the #2 interior door graphic, and exposed matte carbon fibre door sills, air register pods and center console.